The wife and two sons of a policeman gunned down along with his partner in a brazen daylight ambush were joined at his wake Friday by hundreds of uniformed officers, including dozens who saluted as his flag-draped casket was carried into the church. 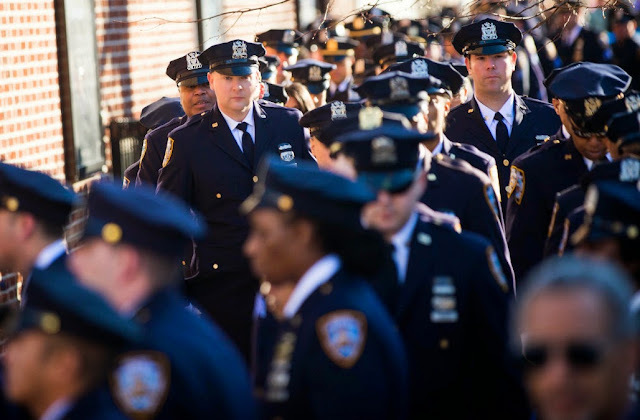 The daylong tribute to Officer Rafael Ramos occurred at a Queens church where friends and colleagues spoke of him as an embodiment of the selfless, compassionate and heroic nature the New York Police Department wants its finest officers to project. "He was studying to be a pastor. He had Bible study books in his locker, which is rare for a police officer, but that goes to show you the type of man he was," NYPD Capt. Sergio Centa said before entering Christ Tabernacle Church.